Better maps – with a new engine under the hood, your maps just got better with support for vector tiles, labeling and advanced symbology. 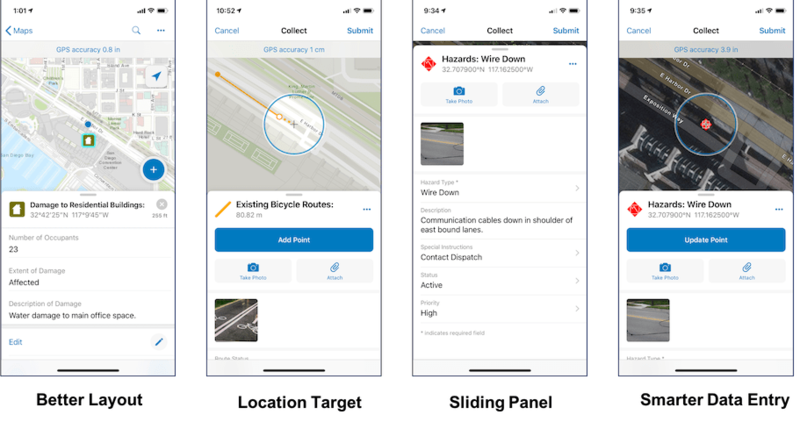 Improved user experience – we modernized the user experience, simplified the way you complete common, repetitive workflows so you can be more efficient, and improved the way you collect location using the map and GPS. New capabilities and tools – locate assets using a new Compass tool, report coordinates using the unit of measure that matters most to you, get driving directions using your favorite Navigation app, view a legend with your layers and much more. 3D data collection – store accurate elevation values from GPS directly into the geometry of point, line and area features. Collector now supports vector basemaps (both online and offline), so that you can view crisp, high quality cartography that takes advantage of the amazing pixel density of your iPad Pro or iPhone XR. Downloading vector tiles to your device will dramatically reduce the footprint of offline content on your device as well. The rich symbology and smart mapping capabilities you rely on to effectively represent spatial information, and often publish using ArcGIS Pro, will look great in this new release of Collector. In addition, it will support labels in your map, including labels defined using Arcade expressions. Easier capture of accurate data locations – use crosshairs that provide a location target experience to precisely define location. Better use of screen real estate – let’s face it, working on a phone often leaves you wanting a bit more screen real estate. Sometimes you want to see the map, sometimes you want to see the form, sometimes you want to see a bit of both. With the new sliding panel design, move between these views seamlessly by sliding the panel up or down to seamlessly move between map-centric and form-centric views to fit your workflow. Smarter data entry – we have a lot of exciting work planned for the form and this release marks the beginning of what you can expect to see. Take a photo with a single tap, capture additional media (video and now audio), read information from a QR or barcode, simplified form editing, support for Arcade attribute expressions, required fields, and use a proper keyboard when editing numeric fields. Collector works anywhere, anytime you need it. Maps can be downloaded to your device and you can synchronize changes when you gain connectivity. Within your ArcGIS organization, you can now plan ahead: prepare the areas to go offline, store them in your content, and share them throughout your field workforce. Mobile workers simply select the map areas they need and download them to their devices. 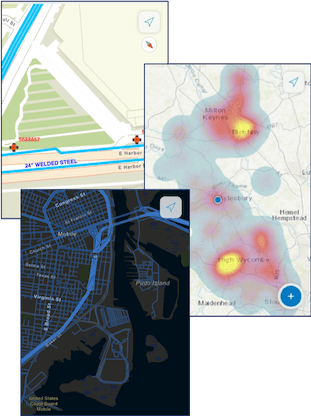 These pre-planned map areas can be created from web maps using the Manage Areas experience in the offline tab of the web map settings or can be scripted using the ArcGIS API for Python. This release brings a much simplified on-demand download experience with the added capability of navigating to bookmarks as potential download locations, centering on your current location using GPS, the ability to download multiple offline map areas from a web map and you can rename the areas you take offline as well. Not only does Collector support side-loaded tiled map packages (.tpk files) through iTunes, but now it supports side-loading vector tile packages (.vtpk files) so that you can copy much larger, high resolution basemaps to your device than ever before. There are major improvements to sync as well. You can sync from within the map, you can auto-sync edits, and with a new sync panel, you can interrogate outstanding edits before you sync them or better understand what features are failing to sync. We have added some new tools and capabilities as well. When locating assets, a new Compass Tool that you can use to navigate to a location using a bearing and distance. 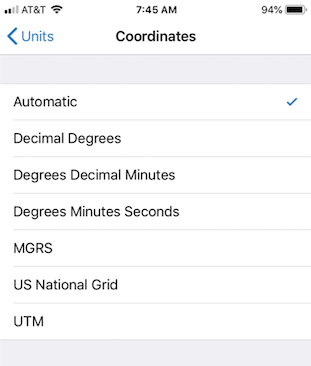 We have added new Units settings where you can set measurement units to US Standard or Metric and then choose how you would like to display Distance, Area and Coordinate units. For example, if you would like to see Area units fixed to Acres, simply change the setting from Automatic to Acres. If you would like to change the display of Coordinates to report Degrees Minutes Seconds, then change it from Automatic as well. Collector now supports the capture of z-values directly into the geometry of a feature when using GPS. In fact, if the undulation value of the geoid is available, Collector will calculate and store the orthometric height directly. In a future release, we will support vertical datum transformations as well so if you do not have an accurate geoid model through your receiver manufacturer, you can transform the elevation value within Collector. With all the new capabilities and changes, we felt a new store listing would not disrupt your existing field deployments. You can run Collector side-by-side with the now, renamed Collector Classic app on the same device as you transition workflows over. So, you will need to download 18.1.0 from App Store to use it. When we release the Android version next year, you will see the same side-by-side release strategy appear on Google Play. As with each release of Collector, we really appreciate all of your wonderful feedback. A special thank you to all of our beta testers and for all of our new users, please let us know how we are doing by emailing Collector4ArcGIS@esri.com. We are excited to hear how you start using Collector within your organization. If you would like to share your experiences with us, please email collector4arcgis@esri.com. If you have comments or questions about this release or this post, please join the discussion in the Collector GeoNet Community site.